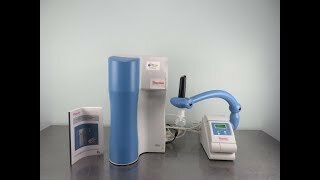 The Thermo Barnstead GenPure Water Purification System with xCAD provides you with convenient remote dispensing of ultra-pure water that’s an ideal choice for molecular biology, microbiology and analytical chemistry applications. This water purifier features a quick connect cartridge replacement, allowing you to change cartridges within seconds, even when in mid operation. This lab water system also features a high-performance UV lamp that oxidizes at 185/254 nm, to reduce microorganisms and metabolites. This mountable ultra-pure water system is microprocessor controlled, monitoring temperature with ±0.1°C accuracy, and has electronic dosing capability of 0.01-65L with <0.5% accuracy. The Thermo Barnstead GenPure xCAD Water Purification System has a real-time clock and code protected operating system to guard against accidental changes or tampering, while a digital microprocessor automatically monitors and stores faults for up to four weeks. For data logs and compliance, this lab water system can be connected to a PC or printer through the integrated RS232 port for data transfer of measurements, dates and times, as well as faults. This type 1 water filtration system has a Resistivity18.2MΩ·cm, a flow rate of Up to 2L/min, and a TOC rate of 1 to 5ppb. This Thermo Barnstead GenPure xCAD Water Purification System has been thoroughly tested and is in great shape. All of our lab equipment comes backed with our standard warranty. Should you have any questions please don't hesitate to contact us.